Leon de Sousberghe, a Belgian ethnologist and Jesuit, took this photograph of a Pende Giwoyo and two Tundu masks used in the Democratic Republic of the Congo. The Tundu masks represent Pende ideas of the anti-aesthetic and were intended to encourage social obedience. 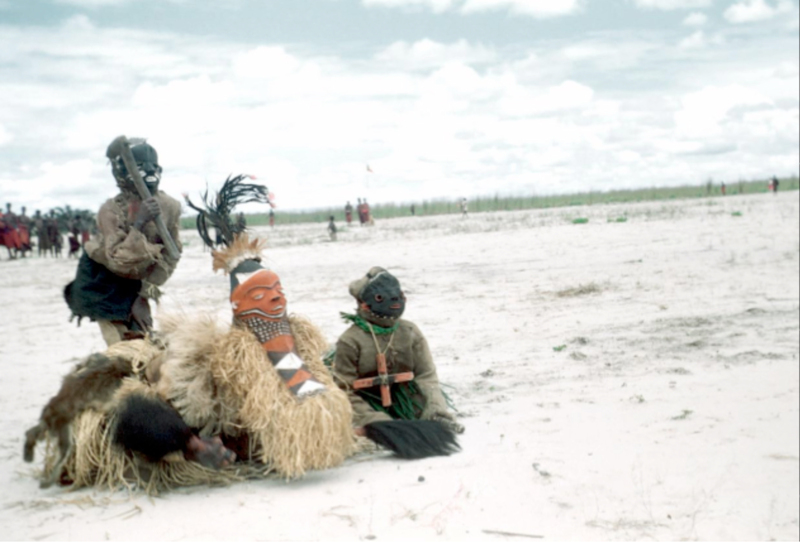 Giwoyo masks, by contrast, are among the most longstanding types of masks still used by Pende performers and are used to usher the spirits of the deceased out of villages. Giwoyo thus always performs in the transitional area between a community and the surrounding wilderness — a zone considered to tie the land of the living with that of the dead. For many Pende, the seemingly endless underground has served as a powerful metaphor for spiritual realms. The Pende mask shown here, of which there is a related example in the Earth Matters exhibition, displays the connectedness of the underground to the living world. Worn like a cap on the top of the head, the mask evokes a face and body floating horizontally above its dancer. The mask is designed to suggest a corpse wrapped in its funerary shroud, the alternating black and white stripes suggesting the journey between the land of the living and the underground.